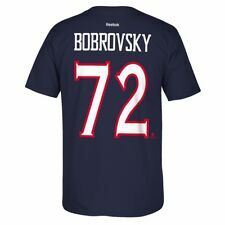 COLUMBUS, Ohio -- Artemi Panarin and Seth Jones were gassed, unable to get off the ice during overtime after weathering a push by Philadelphia that ended with a slick save from Sergei Bobrovsky. Panarin didn't look fatigued. 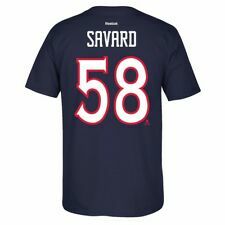 He turned on the speed, broke to the left wing past Claude Giroux and slid a cross-ice pass to Jones, who tapped it in to give the Columbus Blue Jackets a 4-3 win over the Flyers on Thursday night. 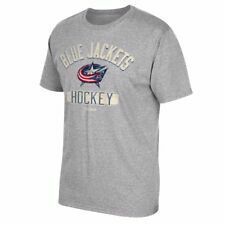 "He just put it on tee for me and gave me a wide-open net," said Jones, who got his third overtime goal this season and set a franchise record with the seventh of his Blue Jackets career. The goal 4:27 into overtime enabled the Blue Jackets to rebound from a loss Tuesday night to Pittsburgh and hop over the idle Penguins and Carolina Hurricanes into third place in the Metropolitan Division. Panarin also scored in the second period, Oliver Bjorkstrand and Scott Harrington each had goals, and Bobrovsky made 28 saves. Travis Sanheim had two goals, Jakub Voracek also scored and Elliott had 36 saves as his two-game winning streak came to an end. Elliott is the seventh goalie used by Philadelphia this season, and the Flyers will set an NHL record when recently acquired Cam Talbot starts Saturday at New Jersey to raise that number to eight. "I thought we kept them under control for the most part," said Elliott, who slipped to 8-8-0 on the season. Sanheim beat Bobrovsky off a nice feed from Voracek to tie it with 6:48 remaining. "We were in total control when it's 3-2," Columbus coach John Tortorella said. "When they score I think we got on our heels. It just looked like we were tentative after they tied it. I was thrilled we get to the overtime. Then I think the ice opens up and it's mayhem when you play that 3-on-3." Both teams had two shots in the overtime period, but Philadelphia looked more threatening until Panarin broke away with the clock ticking down. "He's the best player I've seen when he's tired," Tortorella said of the 27-year-old Russian star, who will be an unrestricted free agent after the season. Columbus is 8-4 in its last 12 games and 9-3 against Metro Division teams. "I think it was good for us to have a win like this, so we know moving forward that no matter how the third period goes or how the game's going, we can hunker down and get the job done," Harrington said. McQuaid played the 500th game of his career but only his second in Columbus. ... Columbus signed F Zac Dalpe to two-year, two-way contract extension. ... G Carter Hart missed his third game with a lower-body injury. ... Bjorkstrand appeared to score another goal in the first period, but it was waved off because he kicked it and it went in off the skate of a Philadelphia player. A few minutes later, a Flyers goal was disallowed because Voracek was offside bringing the puck into the zone. ... Bjorkstrand has points in the last four games. ... Flyers F Sean Couturier has 12 points in his past eight games. ... Sanheim also scored two goals against the Blue Jackets on Dec. 6, a game in which Jones also had an overtime goal. Philadelphia: At New Jersey on Friday. Columbus: Hosts Edmonton on Saturday.